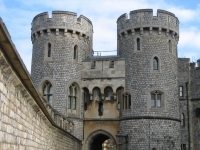 The charming town of Windsor sits on the River Thames, 20 miles (32km) west of London, and is dominated by the magnificent Windsor Castle, the world's largest and oldest occupied castle. The castle was built by William the Conqueror almost a thousand years ago, and has been lived in by English monarchs ever since. Although Buckingham Palace is the Queen's best-known residence, Windsor is her favourite, and is where the royal family spend their weekends. Highlights in the castle include the wonderful State Apartments and the Waterloo Chamber, built to commemorate the British victory over Napoleon at Waterloo. St George's Chapel is one of the finest examples of Perpendicular Gothic architecture in the world, and contains the tombs of numerous English sovereigns including King Henry VIII, Jane Seymour, Charles I and King George V. Many of the castle's rooms contain priceless works of art, including pieces by Rubens, Holbein, Van Dyke, Rembrandt and Lawrence, as well as fine tapestries and porcelain, sculpture and armour. The 500-acre (200-hectare) Home Park sits at the back of the castle and includes the site of Frogmore, where Queen Victoria and Prince Albert were laid to rest. Beyond is the vast expanse of Windsor Great Park, a popular place for walkers. Over the river from Windsor is Eton College, the world-famous school founded by Henry VI in 1440. Opening times: Generally open daily, from 9.30am to 5.15pm (March to October), and 9.45am to 4.15pm (November to February). Please check the website for the full opening hours schedule. Admission: £21.20 (adults), £12.30 (children under 17). Concessions and group tickets available, please check the website for details.